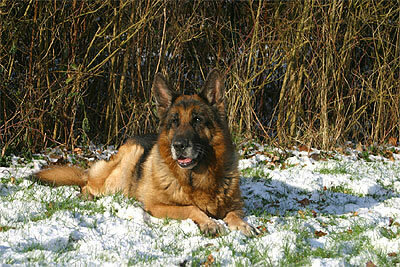 At my urging, Jutta called Margit van Dorssen, the breeder of Ulk, and asked whether we could visit her kennel. We agreed to meet her at her house in Koln. It was a typically overcast German day. 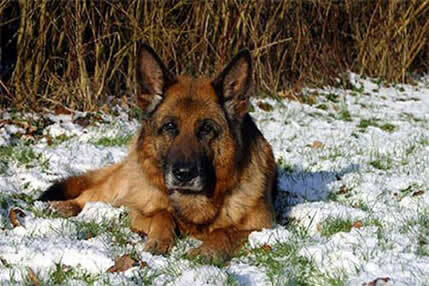 At her house, we were introduced to her husband, Thijs, and her daughter, Alex, as well as the house dog, Flick von Arlett, a half brother of Ulk on the father side. He had a massive structure and head, with a strong black mask. An imposing dog! He was asleep in the sitting room when we entered. He lifted his head, looked at us, and went back to sleep. Flick at eleven years of age! Ulk at thirteen years of age! After we were treated to coffee, Margit drove with us to her kennel, a few kilometers away from her house. She let Ulk out of his kennel into a running area. He was a sight to behold. Ulk exuded a harmony that is rare. He had a beautiful top line and under line, with a head in proportion to his body, and was heavily pigmented. At seven years of age, he was in top shape, with his muscles bulging. He was full of energy, and kept running around. Although at the time I knew little about conformation, I was struck by the beauty of Ulk. Cento, who was with us, waited dutifully in the car. One of the reasons that I had wanted to see Ulk was that he had the same grandfather as Cento, the World Sieger Eiko vom Kirschental. Cento and Ulk were thus both grandsons of Eiko! As we drove back home to Wuppertal, little did I know what was to follow.